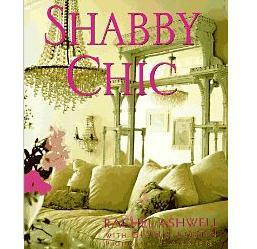 Comfort, the beauty of imperfections, the allure of time-worn objects, and the appeal of simple practical living: these are the cornerstones of what has come to be known as the Shabby Chic style. Like the cosy familiarity of a well-worn pair of faded jeans, the dilapidated elegance of an Italian villa, or the worn grandeur of faded velvets and mismatched floral china handed down from your grandmother’s attic, the Shabby Chic style is a revived appreciation for what is used, well-loved, and worn. It is a respect for natural evolution and a regard for what is easy and sensible. A behind-the-scenes look at a flea market lets readers in on Rachel’s personal secrets of how to cull hidden treasures from flea market trash–an old trunk, its paint peeling around the edges, can be given new life as a coffee table, while a chipped white iron salvage piece becomes the perfect frame for a vintage mirror. This book tells you not only how to restore these pieces but how to find the perfect place for them in your home. Gorgeous colour photographs and accompanying text reveal how this relaxed look works with a variety of different styles, from Victorian to Mediterranean to contemporary.